This article is sponsored by Jungle Joe’s. As the weather heats up and kids head out of school, families set out in search of places to play. The pool is a great spot for making summer memories, but making sure that young children are safe requires full parental attention. If you have small family members, reading and relaxation aren’t going to be happening at the pool! Parks and splash pads offer fun, but it quickly gets too hot to spend a lot of time outside in Frisco. 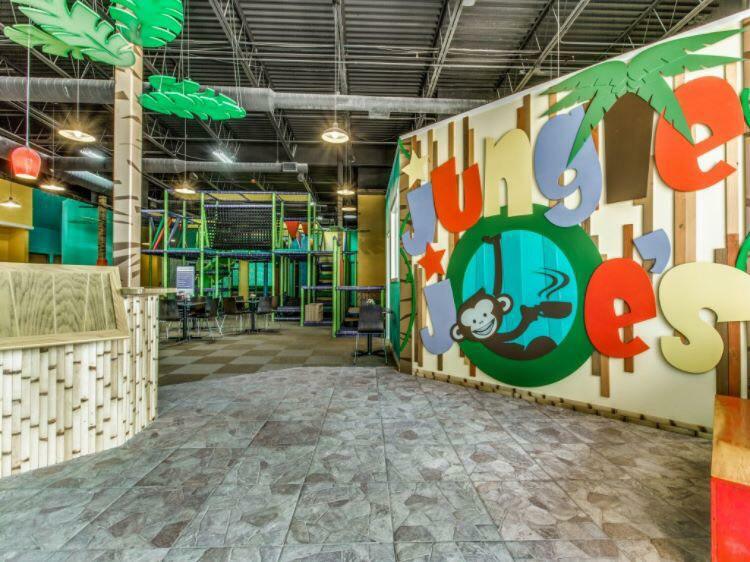 Jungle Joe’s, the popular indoor play space in Frisco, understands that sometimes parents need a place for their children to play safely with minimal supervision while the parents themselves relax, visit, or catch up on some work. At Jungle Joe’s, the “cafe where kids can play” offers parents a comfortable space where they can unwind while kids safely play and get some exercise. The play structure is equipped with cameras that provide complete play area coverage so parents can rest assured knowing where their little ones are on the structure and what they’re doing. In addition to a safe play area, Jungle Joe’s cafe offers fresh delicious snack and meal options so parents don’t need to worry about the hassles of packing food. Kids can easily take a break from play, rest and eat, and head back to the structure while parents chat or respond to emails. Jungle Joe’s even offers craft and art time from 11:00-1:00! A monthly membership allows you to come as often as you would like and stay as long as you want. Members receive 20% off Joe’s Cafe and a free cup of joe, iced tea or bottled water each visit. There are punch cards available as well, and special deals offered regularly, so air-conditioned playdates all spring and summer long are just one transaction away! Frisco Public Library offers a lot of opportunities for play as well as reading and literacy exploration. The Read to Read Railroad feels like a mini Children’s Museum and is equipped with lots of fun sensory activities for younger children. Of course, storytime at the library is also a fantastic indoor play opportunity for the summer months. The Heard Natural Science Museum and Wildlife Sanctuary offers hours of exploration, hiking, and outdoor play for children. The Native Plant Garden and the Pioneer Village alone present children with opportunities for hours worth of exploration. Additionally, preschool and homeschool classes and summer camps provide opportunities for children to be guided and taught by experts while parents relax. Young Chefs Academy offers camps, weekly classes, and workshop opportunities for discovering the tools and tricks of culinary mastery to children. Parents can sit back, content that the younger members of their family are entertained and safe in a positive environment while they learn practical and fun skills even if the temperatures are soaring outside.